Once again Ekadashi is just round the corner. So am sharing another recipe which can be made on that day. Cassava or tapioca is rich in carbohydrates, Vitamin K and minerals like zinc, magnesium, copper, iron and manganese. You have to be careful when buying cassava. If it has bluish blackish specks in the white part, do not use that cassava. Normally cassava is fried or boiled and eaten. 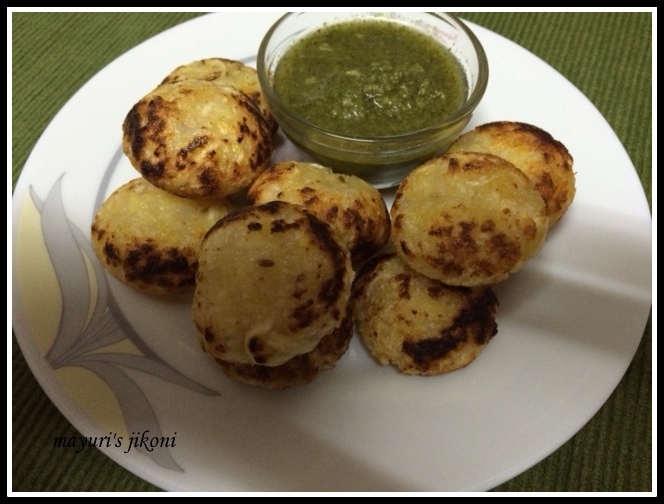 In this ekadashi recipe, I have used it to make nice crispy bhajias or fritters.Cassava in Kenya is called mogo. We all prefer to have fried snacks as they taste so much better. However, hubby and I are trying to reduce fried foods. I decided to make mogo bhajias in my magic pan — the paniyaram. They turned out really nice. Crispy from the outside, and with hardly any oil. It turned out to be a guilt free treat. The recipe remains the same, but instead of frying them in oil, just put the pan on the cooker on medium heat, drop a drop of oil in each hole. Add the rolled bhajia or vada into each hole. Cover the pan. Let the bhajia cook for a few minutes. Turn them over. Drop a drop of oil into each hole from the side if you like. Cook the bhajias and serve them. I didn’t have any extra coriander to add to the bhajia mixture…. made fresh coriander chutney and forgot to leave some for the bhajia. Soak sabudana in some water for an hour. Drain it into a sieve. Let all the water come out. Peel and grate cassava to get 2 cups. Add sabudana and all the other ingredients to the grated cassava. Mix well and form into small pattis about the size of a small lemon. If the mixture is sticky, use oil to grease your hands. You should get about 18 to 20 pieces. Put the ready pattis on a greased tray. Drop a small piece of the mixture into the hot oil. If it comes up after a few seconds, then the oil is ready. Put about 6 to 8 pattis and fry over medium to low heat till they are golden brown. Serve hot bhajias with coriander chutney. Keep the bhajia mixture ready ahead. Shape the bhajias and keep in the fridge or outside if it is cold, till required. Serve these bhajias hot as cold ones do not taste that good. These look really delicious and healthy too as they are not deep fried. Can you eat turmeric if you are fasting??? Love this healthy choice of making casava bhajia. I must try and get a paniyaram dish. This looks too good, must try this soon..
We eat cassava lot never tried in fritters, need to give it a try.